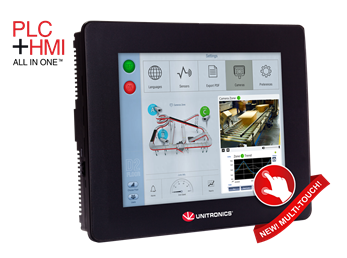 This major release of UniLogic, the programming software for UniStream programmable controllers, introduces Multi-Touch HMI screen technology, familiar to us all from the world of cell phones and tablets. Our new UniStream model, the USP-104M10-PLC, supports a range of gestures such as “Swipe” Navigation, Press, Press & Hold, Double-Tap, Press & Tap and more. Use these to boost your client’s user experience, as well as Two-Hand Operation to increase the operational safety of your end-users. *Cyber-Security Update for FTP & VNC All applications using FTP or VNC must now use passwords of 6 to 8 characters that contain upper and lower-case letters and digits. Upgrading older applications with passwords that do not meet these criteria will result in a compilation error. Hardware Configuration now offers the USP-104-M10. This multi-touch model offers gestures such as Swipe navigation, and enables you to trigger actions via Press, Long Press, Press & Tap, double-tap and more, including Two-Hand operation – a recognized safety measure. A single screen can contain elements configured to different triggers. This enables you to add a layer of safety to your screens. For example, you can implement a 2-point press (two-handed operation) that requires the user to press the screen in two distinct locations to activate a task. You can now easily import, view, and edit EDS files for CANopen devices, as well as automatically create PDO structs. EDS functions enable you to initialize the device with values currently in the EDS file, including values that you edit/enter via UniLogic's EDS utility. In your program, use the In Progress bits to condition the functions. Init Node EDS: Initialize a specific node with values edited/entered via the EDS utility. Restore Node Defaults: If your CANopen device enables this function, which refers to object 1011 in the node's dictionary, you can use this to reset all of the node's addresses to the manufacturer's default values. CANopen Properties now include Enable Heartbeat. Select this to send a heartbeat from the PLC, according to the time interval specified in the parameter Heartbeat time. The time range is 100 (default) to 100000ms (10 seconds). Switching to Stop Mode will automatically send a reset command to all nodes. This version offers the ability to create both Periodic and Aperiodic operations, either one at a time or in batches. Use an Aperiodic Operation to turn a group of outputs ON as the result of a run-time condition. Note that you can prevent an individual operation from running via a bit in the operation's Active parameter. Two new MODBUS Ladder Elements, Aperiodic InDirect and Aperiodic InDirect Group to enable you to trigger a single operation, or a group of operations, via your application. A new parameter in the Remote Slave's struct, Drops can help you to troubleshoot projects with a large number of sensors, where the entire queue of operations may not be able to run during the scan. A Status field has been added to the MODBUS operation Parameters. This will hold the error codes from the MODBUS protocol itself. Note that it must be reset in your application. Use this new Ladder element to receive an SMS message and store it along with its metadata. You can also block messages from unauthorized numbers by creating an Authorized Numbers list in Modem Configuration. Now supports MYSQL, and the option to use either Instance Name, or Port. Float values are now supported. The Scanner Node struct now contains the parameter Connection status. This contains the response status of the connection attempt. Use this widget to stream files from an IP camera that uploads images to an FTP server. The images are cached in a folder on the SD card. Buttons the user to display images, clear the image cache, or to save the images currently being displayed. Both editors have been redesigned for faster, smoother function, and load screens - even screens with many elements -faster than before. Rotation: While rotating, elements will now automatically snap to angles of 90-180° when approaching these angles. To rotate without snapping, first hold down the Alt button on your keypad, then click and begin the rotation. Alignment: Now, the active element is marked by handles. When moving elements, a snap to middle line is displayed. New Live Trend displays a running variable integer value as a curve on a Trend graph. You may define up to 4 curves. Live Trend values are not drawn from a Data Sampler. Live Trends do not store any values, log any data, or create any files. They are convenient for tasks such as representing temperature values, where only monitoring is needed and logging is not required. State Machine Button is now available for Web pages as well as HMI display; use the value of a register to display variable text within a button, and to drive multiple Actions via the button. A new attribute, Password Length, allows you to enter a number to limit the number of characters, 1-32, that the user can type into the field. UniStream now supports the WenQuanYi Zen Hei font which supports Chinese, simplified/traditional, and also Korean. When checked, a new attribute, Retain AM/PM Space, retains the Placeholder space for AM/PM when H24 (24-hour format) is selected. View online/debug values within UDFBs, including local tags, along with a counter 'since last update': simply right-click the Call UDFB function in the Ladder, and select Monitor. A new, easy way to assign tags is via CTRL + Drag & Drop. Press and hold down the CTRL keyboard key, click a tag, and then drag and drop it to assign a ladder parameter or an HMI option. You can drag tags from the tag database window, or a tag assigned as a ladder parameter or HMI option. You can now drag any Formula directly from the Solution Explorer, instead of placing a Formula Ladder element via the Ladder Toolbox and linking it to a Formula. If you download the same project into UniStream, and are connected to the unit, Online mode now begins automatically. You can cancel this behavior via the UniLogic Project tab, by clicking Options and deselecting Start Online after Download. The Ladder ribbon tab contains two new icons: that enable you to find rungs that are disabled, as well as rungs marked "ToDo:". Next entry Frost & Sullivan’s Product Line Strategy Leadership Award! !